This excursion was AMAZING! You get to Coba and the Cho Ha Cenote before all the crowds! The Coba ruins are spectacular, we literally took over 200 pictures during the excursion. This is a must do excursion you will not be disappointed. We had a small group of 12 people, led by Pancho who was the best! The tour was in English and Pancho did an amazing job as the only other Spanish speaking person on the excursion was my boyfriend who speaks English as well, so he didn't let on he could speak Spanish so everyone else could enjoy. We chose to bike ride through the jungle so we could see as much of Coba as possible, climbing the holy mountain which is very high. Wear good sneakers and workout type clothes for this trip you will be drenched in sweat, bring your bathing suit and I would suggest bringing an additional change of clothes to change into after the swim in the cenote to change into. The Cho Ha Cenote was so tranquil and refreshing after trekking through the jungle. Our group was the only ones there along with one other couple, we had the whole cenote to ourselves, no crowds what so ever, I could have stayed there another hour! The spiral stairs to get down into the cenote and back out do get very slippery. 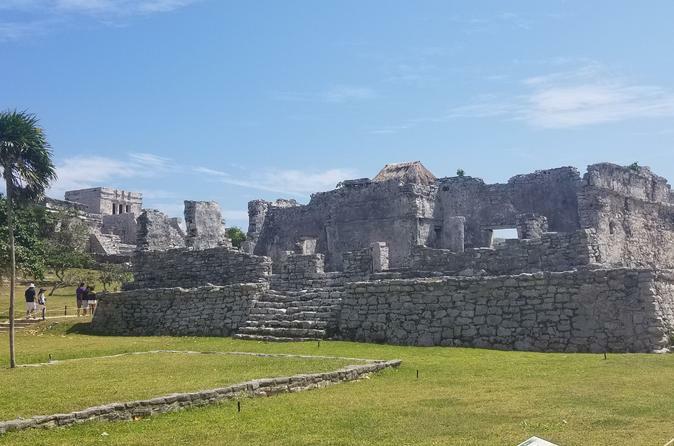 Tulum was gorgeous and so well preserved, lots of iguanas everywhere, they do not bother you they just lay in the sun, but if you are scared of lizards like my BFF just a forewarning. Relaxing at Paradise Beach was nice, we got coconut water that they serve you the whole coconut with a straw in it, then they cut it open for us to eat the coconut meat! We also ordered bacon wrapped shrimp there that were seasoned with a little bit of spice that was divine! Mexico has a seaweed problem right now so there is a lot of seaweed pretty much on every beach but there is a shower available there to clean the salt and such off after a swim in the ocean! If you can do only one excursion I would highly recommend this one and ask for Pancho!!! This was an informative tour. We learned a lot and had a wonderful experience. The tour involves a lot of walking, so make sure you wear comfortable shoes. This was an excellent day with a nice balance of activity and opportunities for rest. We were on a bilingual Spanish and English tour so we had 2 great guides, Poncho and Joel. They were exceptionally knowledgeable and had a clear passion for sharing their culture which made the trip even better. We were picked up very early 6:15am at our hotel and then we left to pick up 3 couples at 3 hotels and the 2 guides in Playa del Carmen. The van was very clean and comfortable and our driver Javier drove safely and made us feel welcome. They provided guests with a cooler of cold water. First, we went to Coba where we were able to climb the ruin. Joel climbed with us and took lots of photos of us from various angles. We also toured the grounds and learned about the history. Next, we drove to the cenote close by and swam there, which was exciting. There are changing stalls so you can change after swimming. Next,. we went to a lovely lunch on a small pond where we saw a croc snapping his jaws! Next., we went to Tulum which is the closest thing to paradise I've ever seen. Finally, we went to Paradise Beach which was underwhelming due to abnormally high levels of seaweed. Tips: Don't forget generous amounts of sunscreen and bug spray, wear a hat and sunglasses, bring at least one change of clothes and bathing suit as well as water shoes you won't want to go in the cenote barefoot, as well as 1 towel per person in your group, a selfie stick, and a small backpack. Because we were picked up so early, we were not able to eat breakfast. I think the tour could be improved by including a stop at a Starbucks or McDonalds or a market so the tourists who have no access to food that early could grab a coffee and a quick bite for the 45 min ride to Coba. Ladies, the bathrooms are minimal at best. You should bring a package of tissues with you because there was little to no paper, no toilet seats, and no flushing. The bathroom at the restaurant mid day was a fully operational rest room, so use your time there wisely. Also, no worries about your belongings. Javier stayed on the van and kept our things safe. There is literally no shade at all at Tulum, so if you're extra sensitive to the sun, bring an umbrella. Overall, great way to spend the day, but I would have preferred to skip Paradise Beach and just get back to the resort at an earlier time. A very early start with pickup at security gates of our resort at 6:20am which made for a long hot day, but well worth it, as we packed a lot into the tour. The group had a total of 14 people, and bus was clean and comfortable. Arrived at Coba early which is very good as it is cooler then and not crowded. Make sure to wear comfortable shoes flip flops aren't enough. It is a 2km walk to the pyramid - suggest conserving energy and hiring a bike limo. Climbing the pyramid is do-able but pretty strenuous and not for those afraid of heights. Next stop was Cho Ha Cenote which was wonderful. They have on-site change rooms so no need to wear bathing suit under clothes. Great buffet lunch and off to Tulum which is much larger than I expected, very crowded at that time of day, and no shade at all - so I would suggest you bring an umbrella for shade. Paradise Beach was great- all sand and no rocks in the water. Its ok to leave your stuff in the van as they have a driver that stays with it all the time, and it is always locked. Driver Joel, Guide Joel, and Guide Gabriel were all warm and welcoming, and the guides were very knowledgeable about Mayan history. A great day was had by all! Absolutely worth it!!!!! I had the most amazing day, honestly no complains. From hotel pick up to Coba ruins, to Cho ha Cenote, to lunch, to Tulum ruins, to paradise beach and then back to the hotel it was a beautiful experience. our driver and guide Hores not sure I spelt that right where awesome, very attentive and knowledgeable. the sights are definitely worth seeing. Climbing the Coba ruin was an EXPERIENCE. I advise you do this one as I heard visitors will soon be stopped from climbing the Coba ruins like they have done at Chichen Itza. I only wish we spend more time at Paradise beach ...but even I was tired by then. It is definitely a WHOLE DAY affair. You'll be tired at the end but everything was definitely worth my time. Joel our guide and Xavier our driver were excellent!! Timely, safe and engaging. This tour was so worth the money. Our kids really enjoyed all the kid friendly tidbits Joel shared. Excellent tour...hitting up so many spots in a day. Time to relax between each location. Cho ha cenote was a beauty! This tour was amazing. Our tour guide Poncho was wonderful...very knowledgeable and answered any questions that we asked. The bus picked us up on time from our hotel and we arrived at Coba before the crowds started. Coba was awesome, nice to be so close up to the ruins. Then off to the cenote with its Crystal clear water. After swimming in the cenote we took a short drive to a restaurant for lunch which was very good. 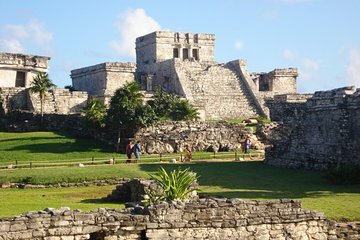 The Tulum ruins were different than the cobra ruins but also worth the visit. The day ended with time on the beach with a very fun outdoor bar. I highly recommend this tour. I would like to thank Poncho and our friendly bus driver for making this tour so enjoyable. Everything about the tour was great, highly recommended for anyone looking for a great but long and action-packed. Our guide was very knowledgeable and enthusiastic, and the ruins especially Coba and the Cho Ha were highlights of my trip but be prepared for lots of stairs and walking as a lot is packed into one day.